The ADS131E0x are a family of multichannel, simultaneous sampling, 24-bit, delta-sigma (ΔΣ), analog-to-digital converters (ADCs) with a built-in programmable gain amplifier (PGA), internal reference, and an onboard oscillator. The ADC wide dynamic range, scalable data rates, and internal fault detect monitors make the ADS131E0x attractive in industrial power monitoring and protection as well as test and measurement applications. True high-impedance inputs enable the ADS131E0x to directly interface with a resistor-divider network or a voltage transformer to measure line voltage, or a current transformer or Rogowski coil to measure line current. With high integration levels and exceptional performance, the ADS131E0x family enables the creation of scalable industrial power systems at significantly reduced size, power, and low overall cost. The ADS131E0x have a flexible input multiplexer per channel that can be independently connected to the internally-generated signals for test, temperature, and fault detection. Fault detection can be implemented internal to the device, using the integrated comparators with digital-to-analog converter (DAC)-controlled trigger levels. The ADS131E0x can operate at data rates as high as 64 kSPS. 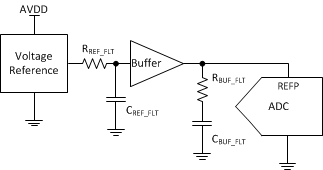 These complete analog front-end (AFE) solutions are packaged in a TQFP-64 package and are specified over the industrial temperature range of –40°C to +105°C.